Robaux SWT16+. Size: 20HP. Current: +12V 100mA. Robaux are a relatively new German company making Eurorack modules. Their latest is the SWT16+, a 16‑track trigger sequencer with up to 64 steps per track squeezed into an impressive 20HP. The layout of the sequencer is compact and straightforward. There are outputs for each of the 16 tracks and just two inputs, one for clock and one for reset. 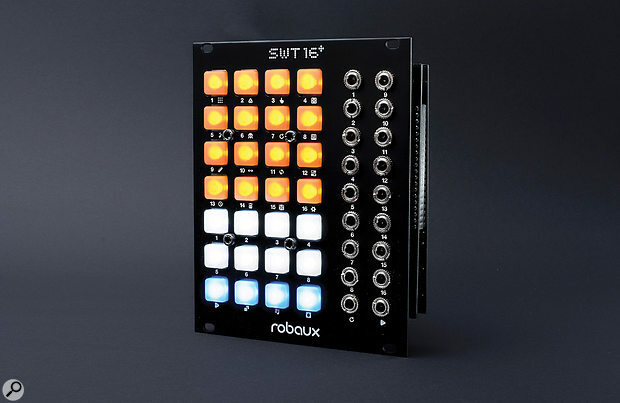 Programming and performance is done with a matrix of illuminated rubberised buttons. The module feels sturdy and will fit easily into a skiff case. You are reading one of the locked subscriber-only articles from our latest 5 issues. Buy this article now and immediately download the PDF file to your computer. Single article PDFs look identical to the printed magazine layouts (but exclude advertisements). Note: Some shorter articles don't always have a PDF version. Option 3: Buy a Digital subscription and open ALL web articles instantly! A DIGITAL sub can be bought from our online ShopStore and used immediately. It opens ALL web articles, the tablet edition, plus Full Issue PDF download... or contact our Subs staff to discuss an upgrade price to add Digital access to your existing Print subscription.